Play single handed with just your left or right hand. 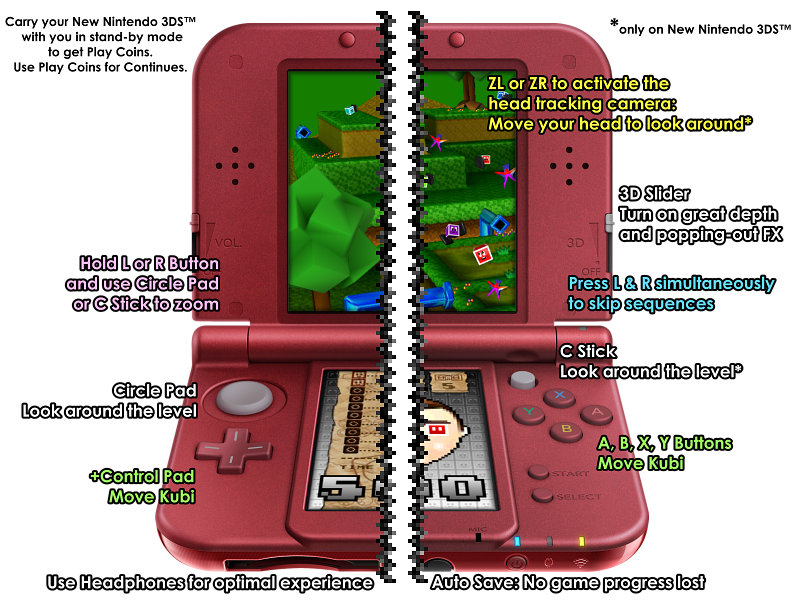 Hold the Nintendo 3DS system in your hands or place it on the table. Play how you like it best, but keep in mind that you can play as fast as you want! Press the direction on the +Control Pad and the buttons together as fast as you can! Just holding it down is okay, but it will not speed up Kubi. Every single press moves Kubi ahead, the faster you press it the faster Kubi will flash around the level! There is NO TIME LIMIT in Phases but the SCORE TIMER heavily influences your score. Rescue a friend or defeat a monster to get score! the score gets calculated and written down to the score list at the bottom screen. fast as possible to get a High Score! Once you have rescued all 7 Pixel Friends in a Phase, they transform Kubi into Rainbow Kubi! Now you are invincible and can rush through all of the monsters to crush them! Finish a Phase with 300.000 or more to get a ZeLeLi-Medal for that Phase. 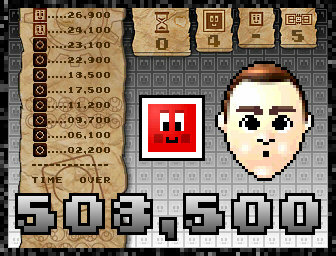 Play fast enough to get an extra life by reaching a score of 400.000 or more in a Phase.